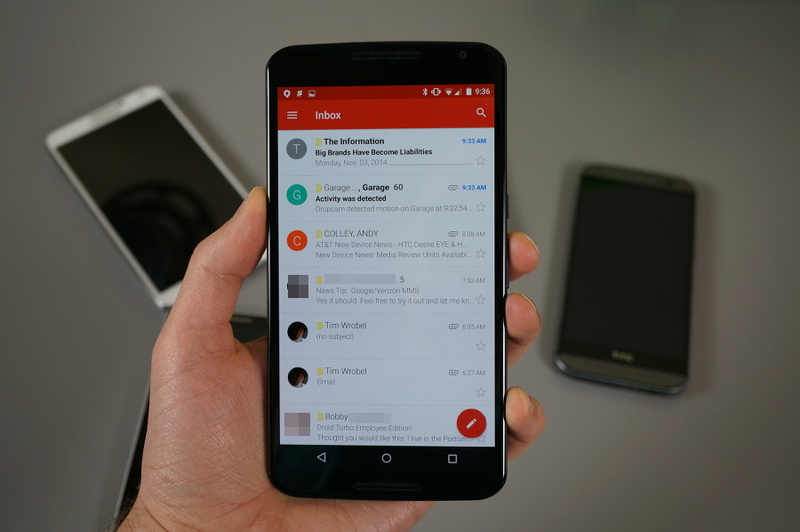 The new Gmail 5.0 app for Android is finally here. 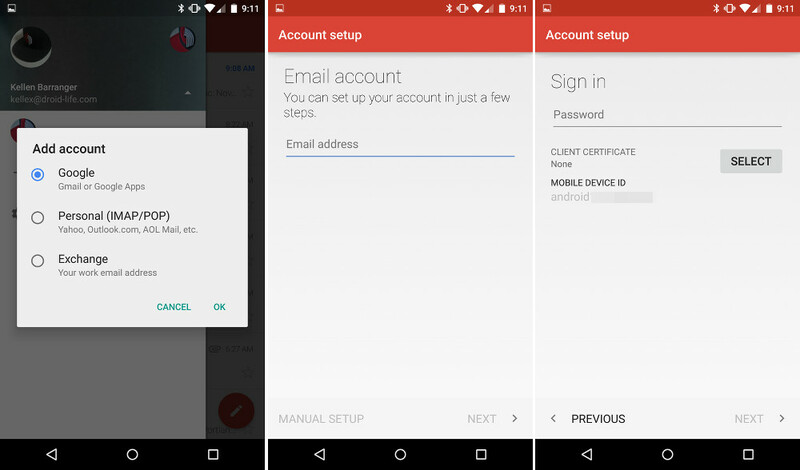 After being teased back at Google I/O and then appearing in numerous images here and there, as well as being featured in a ROM built for the Nexus 4, we can finally talk about its beauty (and new functionality). In case you were wondering, yes, this is the Material Design update with ripples, layers and transitions that also includes support for Exchange and other email accounts like Yahoo, Outlook, AOL, etc. 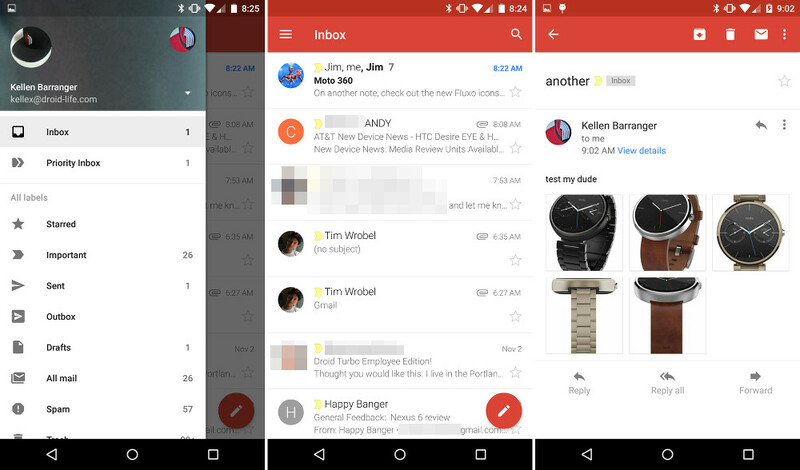 You now have an all-in-one email client on Android that has been built by the Gmail team. How awesome does that sound? Update: You can download it here. Let’s look at what we are working with. The first thing you will notice is the big, beautiful red action bar at the top of the app that blends into the status bar. We have a pulled out hamburger menu icon, a move that seems to be born from Material Design. Tap that icon or swipe from the left and you expose the slideout menu that houses your accounts (including Outlook, Yahoo, etc.) and email categories/tags. You have a persistent search button up top to help you take advantage of Google’s best-in-class email search. Also, to start a new email, all you need to do is tap on the floating red button in the bottom right corner. 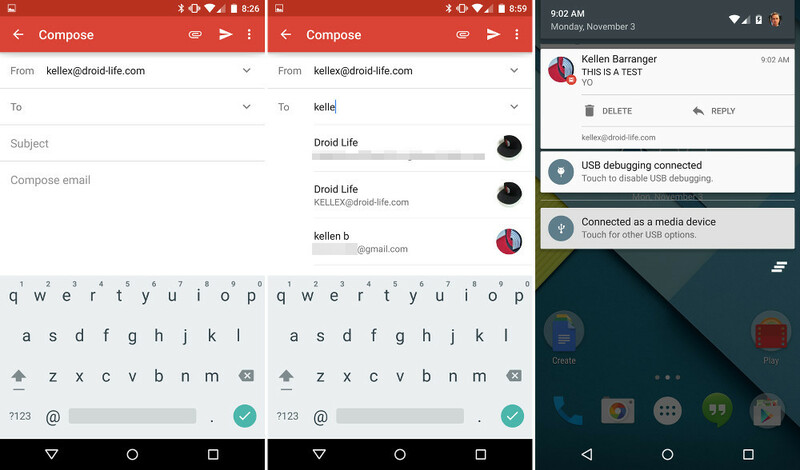 From with the compose window, after tapping that fun little red button, you get a traditional email compose layout, but one that has again, been given a Material Design makeover. It’s simple, has an action bar with attachment/send/menu buttons, drop down menus to give you cc/bcc options, and helpful suggestions as you type out an address or contact’s name. The rest of the app is mostly the same, in terms of settings, notifications, and swiping. I didn’t notice any new settings or options in notifications, plus the swipe-to-archive/delete is the same. 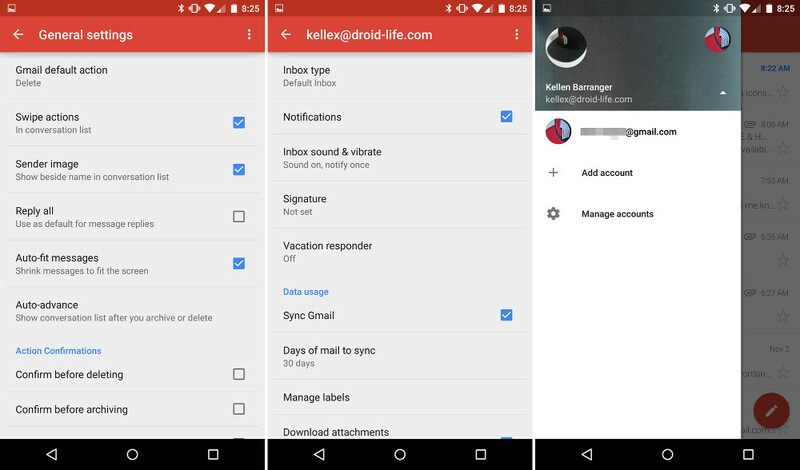 You still won’t find swipes across messages that can do multiple actions, like you will in Google’s new Inbox app. As far as the third party email and Exchange support, it is certainly built in. When you swipe out the left-side hamburger menu, you will see an option to “Add account” that will pop-up a window with three choices: Google, Personal (Outlook, Yahoo, AOL, etc. ), or Exchange. Depending on which you choose, the app will walk you through a series of simple steps to get you up and going. Once setup is complete, your Exchange or third party email accounts will be in the slideout menu’s drop-down as available accounts to use when in Gmail. Unfortunately, I wasn’t able to test this functionality as the only third party account I own is through Outlook.com and it failed over and over again, likely because I have 2-step authentication setup. But again, the new functionality is there. Oh, and here is the tablet layout. Google hasn’t exactly said when to expect the update to start rolling out, but I would guess that rollout starts today, now that embargoes have lifted. Update: Google has now announced that the update will rollout to Android 4.0+ devices over the next few days.